"(Ann Voskamp's) theology is an eclectic combination of Protestantism and Catholic or Catholic-influenced mysticism. She either quotes or is influenced by authors like Henri Nouwen, Brennan Manning, Teresa of Avila, Brother Lawrence, Annie Dillard, and Dallas Willard. This brings to the book a deep-rooted mysticism that at times seems even to border on the view that the divine exists within and extends to all parts of nature (a teaching known as panentheism). At heart, mysticism promotes the view that God can be experienced, and perhaps even best experienced, outside of Scripture. This comes in direct contrast to what Scripture itself says, that Scripture is God’s final and sufficient revelation of himself." In addition to addressing the troubling concept of Panentheism which is subtly taught in Voskamp's book, Challies' also addresses the issue of Voskamp's use of highly sexualized language in discussing her relationship to God. 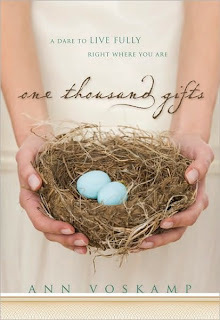 I absolutely do not recommend for any Christian woman who is desiring to grow in discernment to read this book. As noted above, One Thousand Gifts introduces Christian women to the concept of Panentheism, albeit a highly poetic, eroticized, "Christianized" version of Panentheism. But Panentheism is part of the eastern worldview (Hinduism, Buddhism, etc.) and is NOT part of the biblical worldview. The Christian worldview is that we are "dead in our trespasses," (Eph 2:5) while the eastern worldview is that we all have a "Divine inner spark," and at least some aspect of God/Divinity inside of us, regardless of our faith (Christian, Hindu, Muslim, Buddhist, etc.). This concept is subtly taught in Voskamp's book, and Christian women therefore should not read this book. Tim Challies review can be read in its entirety here.